Home › Holiday › Happy Mother's Day! Happy Mother’s Day to all you lovely mamas out there! Being a mom has been one of the most enjoying and fulfilling roles I’ve ever been blessed with. At the same time, it’s also been one of the hardest, most frustrating, and most time-consuming roles I’ve ever been held responsible for! So, today is the day we get to bask in mommyhood – and one of the ways I’ve chosen to do this with my son is through the following “Mother’s Day Gift” I received this Mother’s Day (note: I ordered this “gift” for myself – it still counts as a “gift”, right?) Ha! While not specifically for “Mother’s Day”, this book does touch on the love between a mother and her child. It starts off “My mommy and I are as close as can be…” and ends with “We’re joined at the heart, my mommy and I.” Throughout the book, the author touches upon the ways that mommies interact with their children (“And few things are better than the stories she tells, When it’s time for my nap or I’m not feeling well”), and what I really love about this book is how it also bring God into the penmanship (“We like to dress up on Sundays for church….”, “And we like to give thanks to God for His love…For the shoes on our feet and for heaven above”). 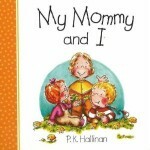 It’s a wonderful book to help children celebrate their moms on Mother’s Day. I’ve really enjoyed it. As an FYI, there is also a book for fathers, “My Daddy and I” that you might want to consider for Father’s Day next month! Hope all of you moms had a wonderful day today! May God bless and sustain you in your role as a mother throughout the upcoming year!